When Scott Meadows was growing up in Medford, he liked to watch his grandfather graft peach and pear trees for Harry and David. His grandpa showed him the age-old propagation method that involves joining a branch from one plant, called a scion, to the rootstock of another plant in the same family. The hardy rootstock allows the scion to mature into a more robust plant that produces fruit identical to the scion’s parent. Grafting is often used for propagating fruit trees and rose bushes that don’t grow true to type from seed. In recent years, it’s become trendy to create botanical curiosities by grafting two or more scions with different characteristics to the same rootstock. An example is the “Ketchup and Fries” plant made from joining a tomato plant and a potato plant. As a kid, Meadows was amazed when his grandpa created new peach and pear hybrids through grafting. This phenomenon occurs when cambium tissue at the juncture of the two plants not only generates new cells to knit the plants together, but also creates cells that combine genetic characteristics of both plants. It’s asexual species crossbreeding. Last year, Meadows, now 50, decided to use what his grandpa had taught him about grafting to combine two of his favorite marijuana strains. He grafted Lemon Diesel, an indica-dominant hybrid, onto a plant of a pure indica strain called Purple Kush. The grafted plant produced new stalks of Lemon Diesel and Purple Kush; in addition, the plant produced a third stalk that was clearly different from either parent. Meadows documented the process of grafting a new cannabis hybrid on video. Last fall, Meadows looked at a flowering bud from the hybrid stalk magnified 1600X under a miniature microscope, and he was astounded to see a purple gland pulsating like a heartbeat. “I’ve been growing for more than 10 years, and I’ve never seen anything like that before,” Meadows said. The hybrid stalk produced about 3 ounces of bud (out of 2-1/2 pounds from the entire grafted plant), and Meadows named the new strain Voodoo Kush. Testing showed the THC level at 29 percent, whereas the average THC composition of Purple Kush is 18 percent, maxing out at 27 percent. Lemon Diesel, a 70 percent indica often recommended for anxiety and stress-related conditions, has a much lower THC level with an average of 13 percent. Meadows saved the Voodoo Kush seeds from last season. He sowed a second generation of plants indoors in January, and then transplanted four starts into his outdoor garden the second week in March when they were 8 inches tall. He planted them in the ground in full sun and has continued to water through the summer by hose in the morning and evening to keep the soil moist. He fertilizes regularly with worm tea, bat guano and fish emulsion when the plants need extra nitrogen. In fact, Meadows loves the growing conditions of Southern Oregon. “I’m thankful to live here, because the Rogue River and Siskiyou National Forest area is noted as one of the most perfect places to grow in the U.S.,” he said. Meadows has high expectations that the second-generation crop will outperform last season’s in yield, taste and THC level. “But we won’t know for sure ‘til the end of the cycle,” he said. 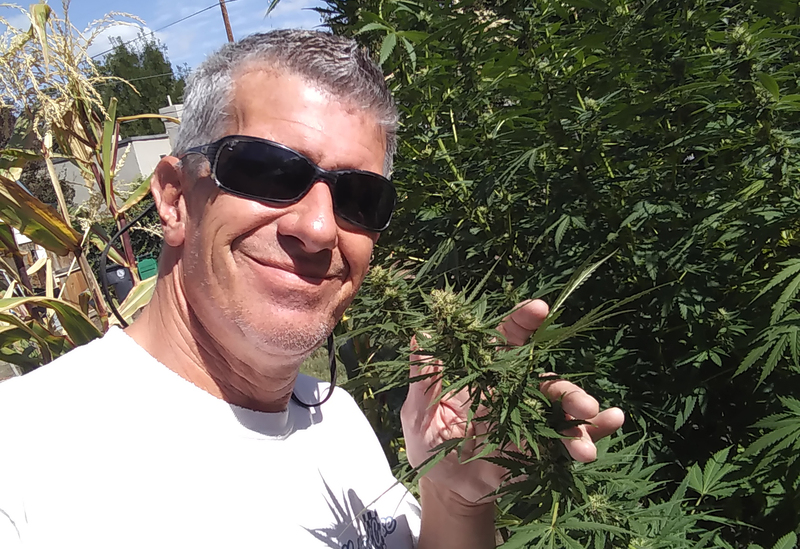 It’s not hard to propagate cannabis by grafting, and maybe you’ll even create a new hybrid like Scott Meadows did. Whip and tongue, or bench, grafting, is commonly used in the spring when joining younger plants with stems about the same size and no larger than a pencil width in diameter. Use a sharp, clean knife or razor blade to make a smooth slant cut 3/4 to 1 inch long on the root stock several inches above the top root. Cut downward to the center of the stem (be careful not to go through too much of the stem). Then make a matching 3/4- to 1-inch cut on the bottom of a scion stem that is about 5 inches long. Join the scion to the rootstock stem, pushing the two together to create a tight contact. Use grafting tape, pine tar, molasses or another adhesive to hold the juncture firmly together. Use fishing line or stakes to hold the grafted plant erect and reduce pressure on the healing union. Place plants under lights indoors for 12 to 14 hours and keep the soil fertile and moist until the union heals. Harden off and set outdoors when frost risk has ended (late April in most of our region).